Garbage Compactor is the machinery of choice for door to door collection of waste. The collected waste is simultaneously compacted and eventually transported to the dumping site. 1. Waste is covered and there is no chance of "spillage" of waste during transportation. 2. Continuous compaction allows more waste to be stuffed onto a truck which reduces the number of round trips to the dumping site. This results in significant fuel saving. 3. Waste collected inside the compactor is pushed out of the container through a hydraulically powered Ejection Plate. 4. Two men are required to perform the entire functionality of the compactor namely, driver and operator. 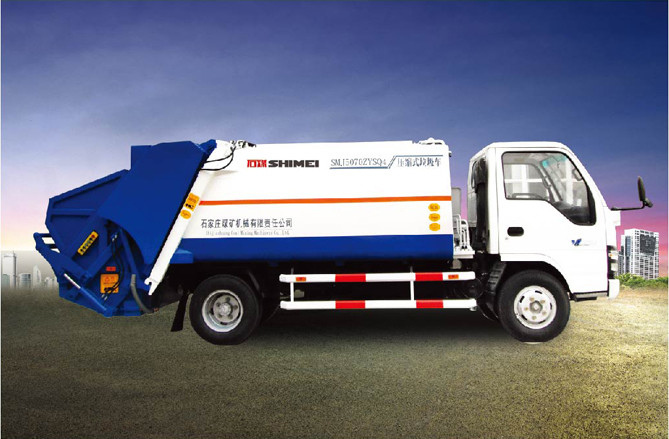 SCMM manufactures compactors with various capacities depending on the type of truck chassis and user requirement.